1. The majority of actors, or two or more of the following, must be JRS/AS clients: Writer, Producer, Director, Editor. 2. Films must be made after August 2018. 3. STRICT ten (10) minute time limit. We HIGHLY recommend that film lengths of seven minutes or less. We will not accept submissions longer than 10 minutes (including credits). Final-cut credits no longer than 20 seconds. 4. All films submitted to the festival must be in their final formatted version – with both a viewable link and hard copy. *If your film does not meet all four (4) requirements, it will not be considered. 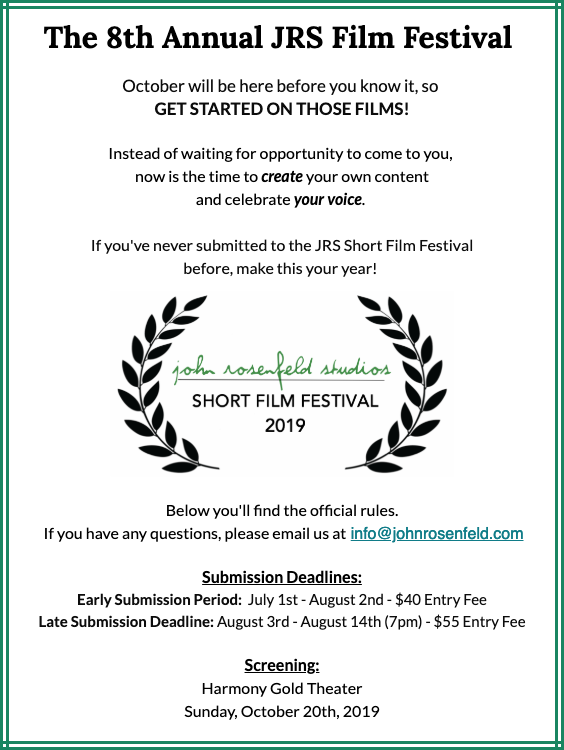 ***Content created specifically for the JRS Short Film Festival will be given precedence. Here’s a look at last year’s Film Fest to get you inspired!